New Event Destiny Wheel: Chance to Earn Free Topaz! League of Angels II would like to introduce a new limited-time event: Destiny Wheel, in which players can get free Topaz and Diamonds! Let’s check how this event works! - Click the “Destiny Wheel” button on the left of the game screen to open the event menu. - There are 2 types of Wheels: Topaz Wheel & Diamond Wheel. Each can get Topaz and Diamonds. 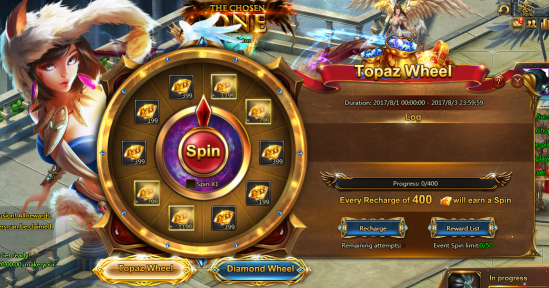 - Players can recharge certain amount of Topaz and spend certain amount of diamonds to get the chance to spin. - When the event ends, any unused Spin attempts will be removed. 2. players can spin 50 times at most everyday. - Every 1000 Diamonds spent will earn a spin and can spin 100 times at most everyday. More exciting events are coming up! Stay tuned! Next：Beauty Contest Between Hero and Angel is Ready!